Button bush (Cephalanthus occidentalis), also known as honey bells and button willow, is a common wetland shrub found mostly in the southern United States and Mexico. This scrubby-looking bush can grow up to 20 feet tall, although normally stays around 6 to 8 feet tall and is best known for its pincushion-like balls that hold tiny creamy-white or green flowers, which bloom from late spring through summer. These balls turn into brown nut-like balls and stay until late fall, at which time the deciduous leaves fall off and the bush becomes bare until spring. Button bush is hardy in USDA growing zones 5 to 10 but does not do well in drought conditions. Select a garden location that receives full sun all day, with some partial afternoon sun, if necessary. The location should provide ample room away from other plants for the button bush to spread out to at least 6 feet wide. If possible, choose a location that is near a stream or pond. Work the ground in early spring by tilling or raking to remove large clumps and loosen the soil. Add a bucket of sand and mix in well. Dig a hole about 1 foot deep and set the button bush root cutting into the hole. Fill the hole in halfway with soil and add water just to cover the soil in the hole; let it drain out completely. Finish filling in the hole with soil and tamp down firmly around the base of the bush. Water well after planting, thoroughly soaking the soil. Use a soaker hose or garden hose for deep watering. Water every other week with one to two buckets full of water, thoroughly saturating the soil. Let the soil dry out in between watering. Button bush tolerates soggy soils, but does not like drought. During extremely hot weather, water once a week if the soil is drying out quickly. Feed in the early spring with a granular slow-release fertilizer. Use a higher nitrogen fertilizer such as 10-5-5 to encourage good root and foliage growth. Nitrogen is the first number on the fertilizer bag. It is not necessary to fertilize more than once a year. Prune the button bush to keep it fairly small in size. It can grow up to 20 feet if not cut back. In the early spring, before new growth appears, remove any dead branches and flowers and cut several inches off all the way around. Button bush responds well to pruning. 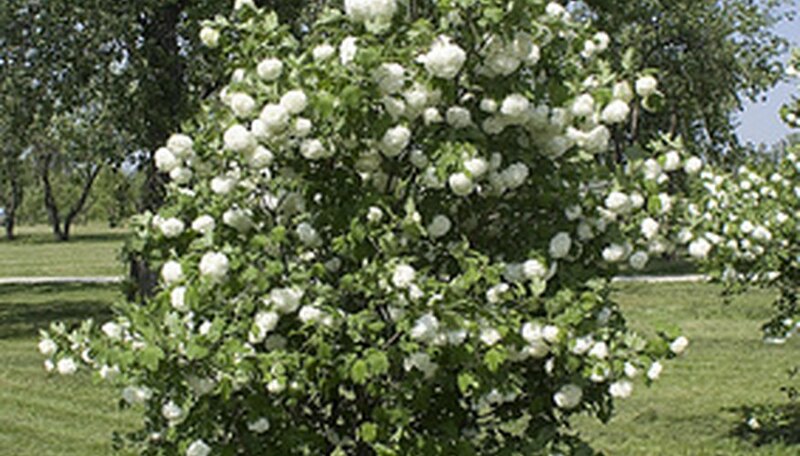 When & Prune Mock Orange Bushes?